Previously, on MinerBumping... 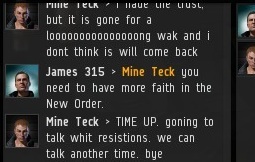 I attempted to find common ground with Mine Teck in order to facilitate peace. But Mine Teck was determined to play hardball, and he gave me just twenty minutes to find a solution to the crisis. I did my best to highlight the advantages of joining the New Order. Most would agree the New Order is a more attractive option than the resistance. 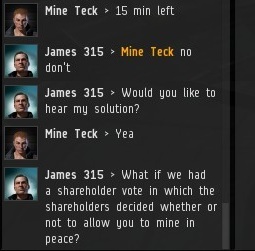 Out of nowhere, Mine Teck brought up old grievances that hadn't been previously mentioned in our negotiations. In any peace process, this is a big warning sign. With the minutes tecking down quickly, I offered a compromise solution: Let the shareholders decide. Mine Teck was immediately resistant to the proposal. 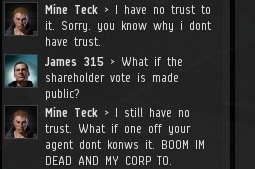 He trusted neither me nor my shareholders. Everyone who has followed the history of MinerBumping knows that our shareholder votes have always been aboveboard. Mine Teck is no historian. 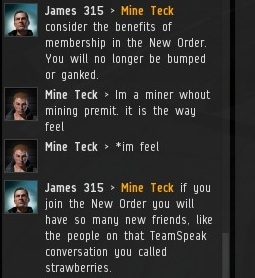 The possibility of a secure, lasting peace between the New Order and Mine Teck was slipping through our fingers. Could two great statesmen really let such an opportunity pass? It was coming down to the wire. Only two hundred and forty precious seconds remained. At this critical moment, the entire summit was nearly derailed. 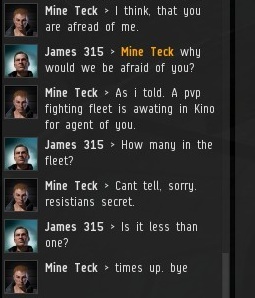 Agent Galaxy Pig randomly appeared in the convo upon my invitation. 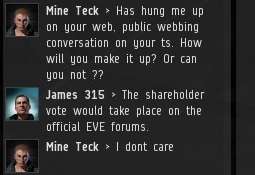 Mine Teck was sensitive to one-on-one conferences being compromised, so he demanded Galaxy Pig leave. For the sake of peace, he did. Then it was all over. All our time was gone, and with it, any chance for peace. ...Until Mine Teck offered another two minutes. It was a tremendous relief. But the clock was still tecking. It was a bold offer from Mine Teck, who had heretofore been reluctant to offer any proposals of his own. 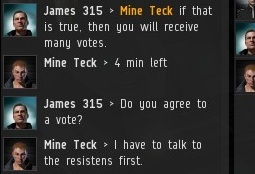 In exchange for having his corp set blue, Mine Teck would pull the plug on the resistance's communications network. 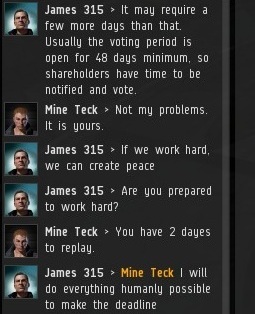 After a couple days, Mine Teck convoed me to get my response. I informed him of the need for a shareholder vote on his proposal, and a new deadline was set. Mine Teck offered but forty-eight hours for an entire shareholder vote to be scheduled and held--a Herculean task. The consequences of failure? Unthinkable. But surely, he should be paying us for his overnight fame and fortune? That bandwidth doesn't come free Mine Teck, so where is our cut? 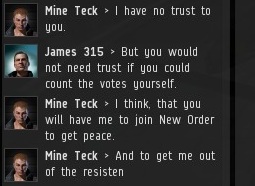 Mine Teck is clearly a terrorist and we do not negotiate with terrorists (suicide gank his mining fleet again). I say, feed him Anti-matter till he cries fat miner tears. 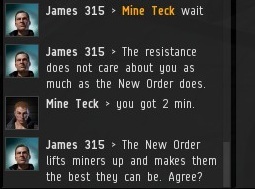 Being ganked by The new order has opened my afk miner eyes... Now I bot haul contracts across high sec, earning 30% more isk per hour while maintaining up to 2 full hours of complete non-interaction. I don't even have to pay attention to lock asteroids... Nor do I need any good reputation or skills for refining... Sometimes I make the same money in 30 seconds that would take a miner 30 minutes to earn... And completely afk. Very impressive, you've found a way to earn 30% more than you did flying a mining barge, by spending orders of magnitude more on a freighter + collateral. Congratulations on becoming a juicier target. Miniluv will always be watching. Remember, when miniluv starts touching you, to yell "Do it to Julia!" Easier than cargo containers is merely to use an alt to double-wrap the shipment in 2 or more levels of courier contracts, which has the same effect without needing to use containers or rely on your clients to do something. However, P.G. 's point aside still holds for that scenario as well. Old information. You can easily look in shrinkwrap these days. "Old information. You can easily look in shrinkwrap these days." I just double-wrapped a module inside 2 nesting courier contracts, literally 30 seconds ago, and attempted to scan it(on Tranquility). The scan still only pierces one level of shrinkwrapping, same as before. a shipping container inside a courier contract is the same situation. Did you try right clicking on the second package for a context menu? Just curious. But you can still bet that such a package will scream "shoot me!" to a ganker. The 'resistance' has its own TeamSpeak server? There is a wealth of hilarity waiting to be mined from this. I propose that the New Order sends a peace delegation of its bravest and most articulate Agents to venture boldly to that wild, uncharted voice server. 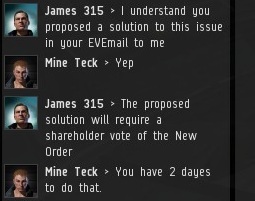 according to James, it takes 48 "days" to assemble a shareholder's vote. ...well, at least it's still more efficient than congress.